It’s true – growing older is a beautiful privilege, but let’s be honest, some of the changes we face as women are downright uncomfortable. Heart disease, chronic joint pain, and menopause are just a few of the unpleasant sides of aging. 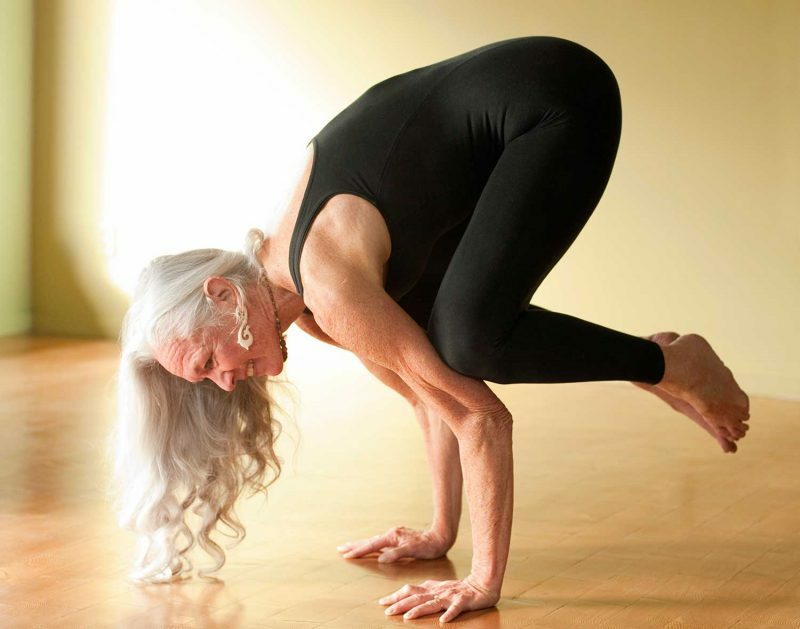 Fortunately, yoga acts as a fountain of youth by providing relief from discomfort and bringing joy back to the aging process. 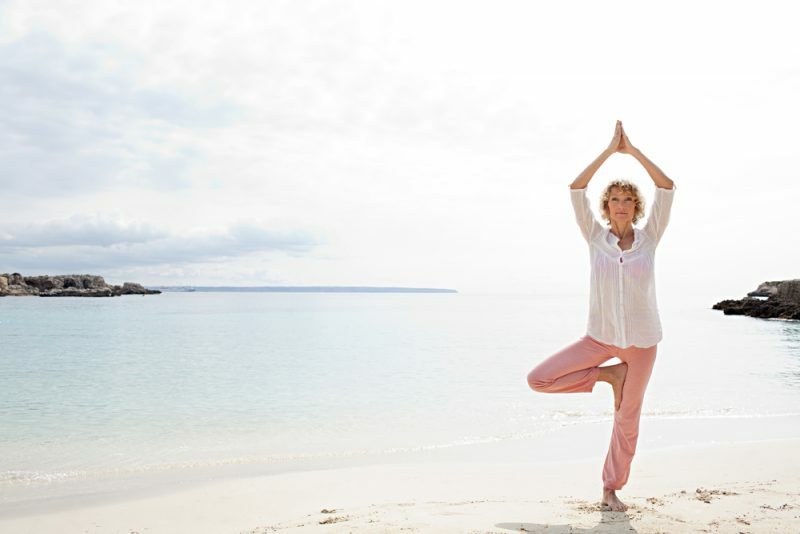 Learn to wholly embrace a new chapter in life while finding a deeper connection between mind and body with the following yoga postures. As these dramatic shifts and changes take place in the body, it’s common for our sense of balance and stability to become weakened. The only way to navigate this new equilibrium is by strengthening the muscles needed for balance and consistently challenging ourselves. From a standing position, notice the feet firmly planted and the upward movement of energy through the spine. Begin to shift weight into the left foot, spreading the toes and grounding through all four corners of your base. Slowly bring your right foot to the inside of the left ankle, calf, or thigh depending on the level of difficulty you need. Don’t be afraid to experiment in order to find the variation that’s right for you. Bring the palms together at heart center and perhaps lift both arms overhead after a few cycles of breath. Stay steady by tightening the abdominal muscles and keeping the gaze directed on one none-moving spot. Moving with the theme of this pose, imagine tree roots extending down from the left foot and anchoring you to the floor. Use support, such as a chair or wall, when necessary to make this pose safe and accessible. This mild inversion comes with a variety of health benefits that make the aging process not only bearable, but dare I say, enjoyable. 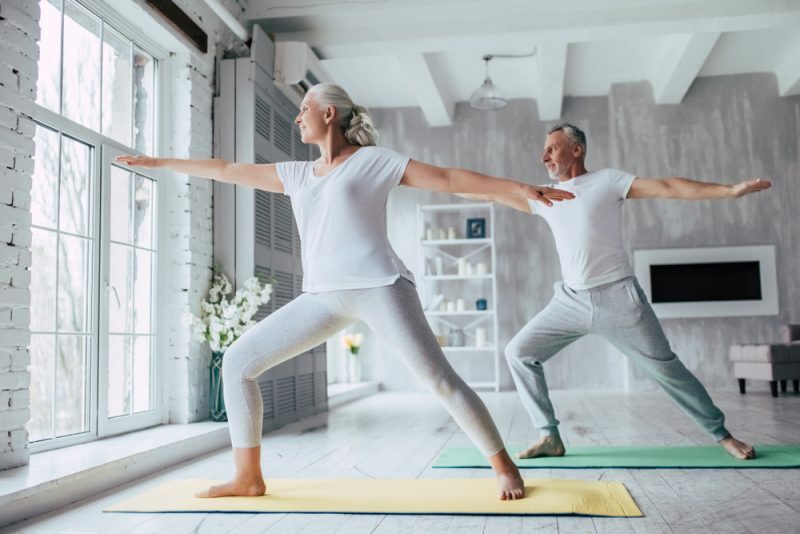 Some of the perks include the prevention of symptoms related to menopause and osteoporosis, hip and hamstring flexibility, relief from back pain, improved circulation and digestion, less stress, and better sleep. It’s safe to say that most people could benefit from this pose, and women in particular will notice the effects of forward folding on their health over time. From a standing position, hinge forward at the waist to fold; legs can be together or wide depending on what feels the most accessible. Keep a gentle bend in the knees as the head and neck relax. Find a variation that works for the arms, perhaps grabbing opposite elbows or letting them go heavy towards the floor. If a little extra support seems appropriate, try sitting on a chair and carefully folding from there. Seated forward folds are generally more accessible than the standing variation while offering many of the same benefits. In addition, it stimulates uterine, kidney, and ovarian function to ease symptoms of menopause. Similarly to standing forward folds, seated folds come with several options for leg and arm placement. Try bringing the legs wide, or the soles of the feet together with knees wide, for sweet hip and inner thigh stretch. If you choose to keep the legs straight and together, draw the kneecaps up and stay active through the lower body to deepen the fold. Bring a rolled blanket under the sit bones or use a yoga strap to make this pose the most beneficial for your body. Not only is child’s pose a great resting spot, it also comes with several health benefits that aid the body in handling natural aging processes. It relieves harmful stress and anxiety by inducing a sense of calm that promotes deep relaxation. Tension in the shoulders, neck, and back are all pacified and prevented while the internal organs receive a gentle massage. The delicate pressure placed on the organs enhances their function and overall health, which makes aging gracefully a possibility. Begin kneeling with a blanket under the knees for support and knees either wide or together depending on your current range of movement. Slowly sink the hips towards the heels as you walk the fingertips forward and rest the forehead down on either the mat or a block. On an inhale, imagine space and length being cultivated in the back body, and as you exhale, soften the hips and the heart further down. To make this posture even more restorative, try bringing a bolster under the torso and relaxing for 3-5 minutes. Stiffness in the body doesn’t stand a chance against the powerful healing properties of bridge pose. Sitting for long periods or a lack of physical activity contribute to chronic achiness, but restorative postures like supported bridge help alleviate that tightness. It brings space to the front of the hips while engaging the back body. You’ll also get a good nights sleep after indulging in this decadent backbend as it’s great for resting the body and mind. Start flat on your back with both feet planted at hip-width and arms by your sides. Gently move the shoulders under your body to open the heart center up. Root through the hands and feet as you inhale to lift the pelvis towards the ceiling. Activate the quadriceps and core muscles to protect the back while elongating the neck by bringing space between the chin and chest. Whether you’re in need of a therapeutic experience, or something a bit more active, bridge pose has something to offer just about everyone. Place a block or bolster under the sacrum and melt into a restorative take on this mild backbend. Aging can be hard on the back, but cobra pose can ease discomfort and improve spinal flexibility to keep you feeling limber and ready to keep moving. Lie flat on your belly with palms planted under shoulders and tops of the feet on the mat. Direct the elbows straight up as you soften the shoulders back to avoid further stress on the back. It may be helpful to bring a block between the hands for added support as you start navigate this shape. Inhale to lift the chest from the floor by pressing through the hands and tapping into the strength in the back body. Continue to draw the shoulders back and the pelvis down as you breathe here. Spinal waves are an excellent way to check in with any existing tension in the back while bringing movement to stiff areas. Come to all fours with wrists stacked under shoulders and knees resting on a blanket under the hips. Spread the fingers wide and tuck the toes to take unnecessary weight off the knees. Inhale to lift the gaze and tailbone while dropping the belly towards the mat. Exhale to round the back by tucking the chin and tail under while drawing the navel towards the spine. Flow through these movements as long as you’d like, continuing to stay connected to the rhythm of the breath. Twists work wonders on maintaining spinal flexibility and keeping the digestive system working effectively. Find a comfortable seat on either the floor, a block, or a chair with the spine straight. Inhale the arms overhead and exhale as you twist towards the right, bringing your right hand behind and your left hand to your right side. If it’s comfortable on the neck, let the gaze travel over the right shoulder. Avoid forcing yourself deeper into the twist, rather try to initiate the movement from the lower spine and follow up to the neck. Warrior I can be credited with keeping the lungs, chest, and hips open while increasing strength in the back, ankles, legs, arms, and shoulders. It’s a tune-up for the whole body and even improves circulatory and respiratory functions. This energizing pose should be explored with caution, so take any necessary modifications to avoid injury. Start standing and step one foot back into a wide stance. Bend the front knee and stack knee over ankle. Turn the back foot flat at a 45-degree angle and squeeze the thighs as you inhale the arms overhead. Turn the palms in as the shoulder blades soften down the back. Pull the hip on the side of the bent leg back to level the pelvis. Warrior II is a powerful hip and inner thigh opening posture that plays on focus and alignment. The strength cultivated in this pose prevents future strain and keeps the body feeling youthful longer. Start standing and step one foot back to take a wide stance. Match the front heel to the back arch as you settle deeply into the front knee. Try to get the front knee as close to a 90-degree angle as possible. Allow the tailbone to descend towards the floor as you open the arms out in a T-shape, being mindful of reaching equally in both directions. With each breath out, allow the shoulders to ease down the back and the thighs to draw inward. With each breath in, feel the heart lifting and the legs engaging.